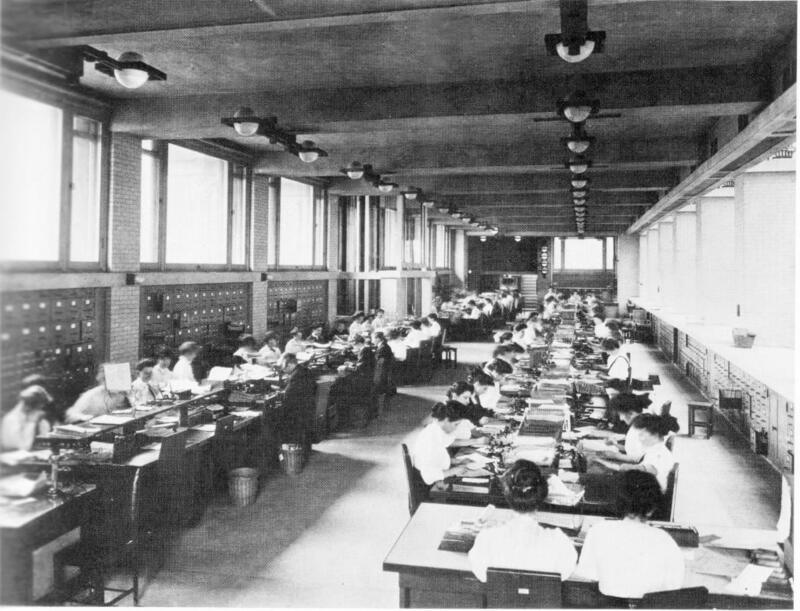 1900s – The Taylorist Office: An American chap, Frederick Taylor, was an engineer who was obsessed with order and efficiency and one of the first to design an office space. Similar to a factory floor, Taylor’s design featured workers evenly spaced along rows of desks inside one open room. The managers and owners were situated in separate private offices, usually on the upper levels, to establish their authority. Pros: Simple yet effective. Taylor brought organisation and structure into the workplace. Cons: An open space full of telephones and typewriters meant the noise was deafening. 1930s – The Streamlined Office: The “Roaring 20s” gave birth to the Pretty Young Things, glamour, wild parties and Art Deco design. This sociable culture flowed into new, stylish buildings that were buzzing with interaction, despite not moving far from the Taylorist structure (private offices being separate from the “workers floor”). Pros: Gone was the factory style décor to make way for the Art Deco architecture, bringing a sense of modernity to the workplace. Cons: There was still no connection with the outside world, in some cases not even windows. 1950s – The Open-Plan Office: We’re sure you’re familiar with this one, but do you know where it originated? A new concept created by the Schnelle brothers from Germany called the Bürolandschaft, which translates to “office landscape.” Bürolandschaft was intended to banish hierarchies and improve communication; desks were grouped together with large ferns and screens for a little privacy. Open-plan had its issues though. It started getting attention in the press in the 1960s due to a change in office dynamics: In 1968, The Observer ran the feature, “Would you let your daughter work in an open-plan office?” This was due to women being unable to wear trousers to work despite their desk being in full view of everyone in the room. The solution was a “modesty board”, a section of plywood attached to the front women’s desks. Pros: This layout improved communication and introduced a refreshing, relaxed sense of community. Cons: Aside from the before mentioned ‘modesty board’ issue, there was no structure or planned positioning of furniture, offices were often in chaos and looked messy. 1960s – The Action Office I & II: In 1964, the brainchild of Robert Propst was introduced by the infamous furniture design company, Herman Miller. Action Office was a space designed for movement and with the help of designer, George Nelson, incorporated technology such as a “communication centre” with an acoustically insulated telephone. All were extremely colourful and included prints from Warhol and Lichtenstein – another era where pop culture was implemented into office design. Pros: Action Office I was innovative, modern and exciting. Action Office II enabled modification without extra cost and promoted flexibility and individual work spaces. Cons: Action Office II sparked cubicle farms, enough said. 1980s – The Cubicle Farm Office: Action Office was invented to boost communication and freedom, however, it started a formation that was the complete opposite! Naturally, to fit more employees into one space, the angled walls transformed into cubicles. The grey, felt-covered walls were high enough to block out others around you, as well as natural sunlight. This was a bleak period for office design in which directors had less interest in their workers’ well-being and more about their profitability. These farms carried on well into the 90s. Pros: As workers had only a blank wall or a computer screen to stare at, productivity went up. Cons: Referring to the point above, the lack of employees’ happiness and sense of community in the workplace went down. 1990s – The Virtual Office: One of, if not the biggest development of the 1990s was the World Wide Web, transforming the workplace in multiple ways. In terms of design, offices could spread over more rooms, cities and even countries through the use of email. Open-Plan Take II: Revamped and stronger than ever, today’s open-plan offices present a range of workspaces, from high window benches to squashy armchairs. Overly popular due to collaboration and movement has been proven to maximise productivity and focus whilst maintaining overall employee happiness. Imagine & Inspire: Nowadays there are very few boundaries when it comes to office design. Table football, slides, indoor picnic areas and sleeping pods to name a few crazier additions. The comforts and sociable environments of home are being repeated in the workplace, constantly offering creativity and imagination. Both Inventionland & Instagram are prime examples of just how far you can go. Nomadism: With the introduction of the Cloud, all company data can be easily accessed and stored securely, meaning that employees have more freedom than ever before. They’re not fixed to one screen, instead, they can move around the office or work on-the-go. Remote working is also a huge trend, especially on social media. With more young entrepreneurs escaping the corporate, commuting cities and heading to more exotic, adventurous locations to work from – allowing them to travel whilst they work. Don’t Worry, Be Happy: Gym memberships, yoga classes, cycle spaces, casual dress codes, even allotment gardens and roof terraces are seen as key, almost essential, features when selling (and buying) office space. A happy team = a profitable business! There’s one way of working come new trend of office design which encompasses all the above, but that we haven’t mentioned yet, can you guess? COWORKING. Coworking was born around a decade ago, but has only burst out as a trend in the last five years. The combination of open-plan, private offices, community and social opportunities and high-quality design has been well-sought after by companies of all sizes. At LABS, we’re adding a twist – technology and support. Growth is the most important thing to a business, therefore it is to us.